Flora's Carter Beats the Devil is the OG of East Bay spicy drinks. Oh fall, when cocktails start trending toward nutmeg and cloves and butternut squash infusions. The flavors come straight out of a New England idyll, well-paired with the crisp crackle of fallen leaves, a long day picking Granny Smiths, and all such autumnal clichés. But this is the East Bay, not the East Coast. While a maple-sweetened cocktail may have cuteness appeal, there's a little cognitive dissonance here. This year, we thought a roundup focused on spicy — not spiced — cocktails would be a welcome change of pace. This way, you can acknowledge the dropping temperatures outside without feeling like a refugee from a Vermont prep school. The OG of East Bay spicy drinks, of course, is Flora's Carter Beats the Devil. It gets its name from a rollicking magical mystery novel, its inspiration from a 1939 gentleman's instructional manual, and its heat from a searing tincture made with Thai birds-eye chiles. Erik Adkins, now at the Slanted Door in San Francisco, said he stumbled across Charles Baker's Gentleman's Companion while designing Flora's cocktail menu five years ago. The book is notable both for its hilariously dated prose and its spot-on cocktail intuition. Adkins tinkered with the book's "Hellfire Bitters" recipe until he liked the proportions, then mixed them with tequila, mescal, agave nectar, and lime, and, voilà, a devil was beaten. Adkins said it immediately became Flora's most popular cocktail, and has shown incredible staying power ever since. The Spicy Q features the tropical pairing of rum and pineapple gum, but with the punch of serrano peppers lurking right beneath its festive surface. Cilantro also adds an herbaceous touch, but there's no question: Peppers are this drink's dominant flavor. Bar manager Erik Ginther achieves a little more balance with the Boom Boom, mixing serranos with cucumber in a yin-yang, hot-cool purée. This mixture is then added to a Carter-like blend of tequila, agave, and lime. Ginther said that while both drinks go down pretty smooth, they're happy to adjust the serrano ratio for hotshots. Hopscotch owner Jenny Schwarz freely admits that the Domino's eclectic jumble of ingredients doesn't sound good on paper. It's hard to wrap your head around scotch, blackberry, lemon, Amaro (an Italian herbal liqueur), and jalapeño keeping company in the same glass. But it turns out that raw jalapeño is a natural complement to smoky, peat-rich scotch, tempered by citrus and a little berry sweetness. It's all about proportion, and this one is so precisely tuned that no element is lost in the equation. Schwarz says it's a scotch drink for people who don't like scotch. Ozumo's happy hour tequila drink Habu was invented by Ozumo bartender Michael Manu, bracing an ornery chili simple syrup with grapefruit juice and fragrant Thai basil. Habu was aptly named after a Japanese pit viper, with a burn that blossoms in the front of your mouth before spreading its venomous kick all the way through. Manu said he had to tone down the formula after too many returned drinks, so the version Ozumo serves now is muted. It's still delicious, but it feels almost too restrained, like a cocktail with kid gloves. For a thrill, ask Manu to whip you up the original version. Or, you can order his off-menu shot Thin Line Between Love and Hate, a secret concoction with a floating orange halo in the center. 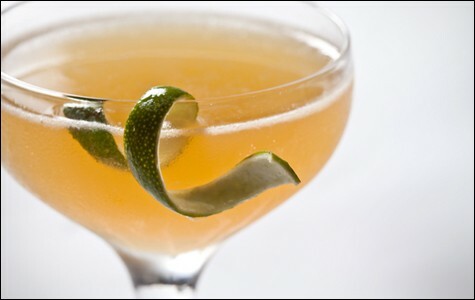 It has the initial sweetness of a liqueur, but with a spicy wallop that lingers. Six types of chili may go into the Jack Satan's "infierno tincture," and dried chili dust may rim your glass, but the end result is as tart and sweet as it is fiery. The base is tequila, hibiscus syrup, lime, and chili, with a host of subtler elements (vanilla, cinnamon, orange zest) fleshing it out. The resultant Jack Satan is more thoughtful than its devilish name would imply, a full-bodied cocktail that teases while it burns. Lead bartender Matt Campbell said the infierno tincture is versatile; you might want to try it in one of Comal's other tequila or mescal cocktails (Hint: margarita). This may be the smokiest cocktail on the list, but it's certainly not an overwhelming campfire in a glass. A very nice smoky mezcal is mixed here with chipotle syrup, Amaro, lime, and an unmistakable hit of molé bitters. It's a smooth, seductive heat, finished nicely with Cyprus black salt on the rim. Head bartender Nat Harry said she worked hard to achieve this drink's balance of smoke and fire. Bar whiz Alex Smith has made many a spicy concoction at his various gigs (Gitane, Smuggler's Cove) but at Honor Bar, his spiciest drink is made with the mild thrum of a guajillo pepper. The Porfiriato is made with tequila, guajillo-infused mescal, sweet vermouth, and cinnamon bitters. Saying he isn't into drinks that show how macho you can be, Smith enjoys using heat "in a controlled manner to give a cocktail that extra dimension of flavor." And Stella Davies at Bocanova has a Carter-esque drink called the Cesar, with tequila, muddled jalapeño and cilantro, agave and lime juice. Davies likes using spicy elements in her cocktails to enhance your dinner. "It has the ability to make certain cocktails very food-friendly," she said. "This enables me as a barkeep to pair them all throughout the meal." There are so many new bars in downtown Oakland these days that figuring out where to go can be a mind-bending task. So we made you a flowchart. Coffee brewing has gotten rather fancy these days. Is it worth all the fuss? Plus overdue bagels, new street-Korean in West Oakland, and an early farewell.